This blog post comes courtesy of Palmdale, CA. The hubby and I are in town for the week celebrating my grandma's 90th birthday! It's definitely a nice day out today to celebrate one of my heroes, or rather, one of my heroines growing up. It's going to be a decadent weekend- filled with love, laughter and food. 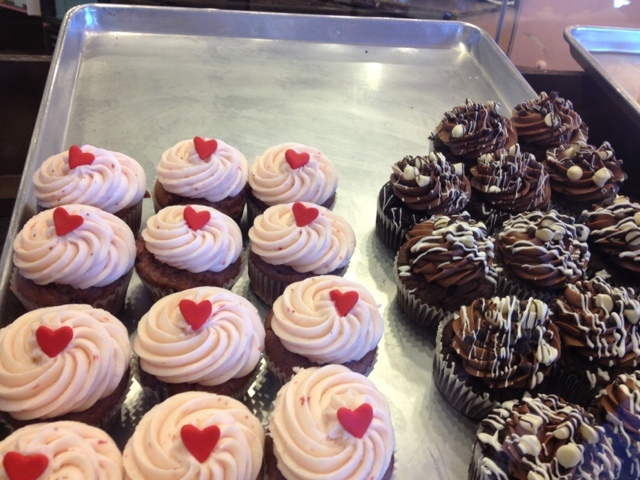 Just a sampling of what is to come- some dessert from Nadia's Cupcakes. Nadia's Cupcakes participated in 'Cupcake Wars' and won. We've been going to them since they opened their store here in Palmdale and I'm glad to see that their business is now really booming. I live for their Red Velvet cupcakes. And, some homemade old fashioned Filipino food and hopefully some BBQ. Need to ask my dad if he's bbqing some. Here's to life! Happy birthday nanay! Love you!